Ask most people who are the oldest civilization or where the oldest civilization lived and you'll here answers like Mesopotamia (Iraq), Egypt or Iran. While these cultures can be traced back to 4000 B.C., the mysterious ruins of Tiahuanaco, in Bolivia, could be 14,000 years old! If you think the Great Pyramid in Egypt is a technological marvel, wait until you see what artists and engineers were doing in Tiahuanaco. This culture thrived at the breathless, oxygen deprived elevation of 13,000 feet. They managed to somehow move stones weighing up to 200 tons and invented modular building techniques that would even today, be cutting edge. 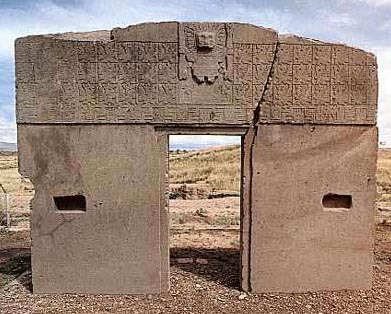 The most famous icon of the archaeological site at Tiahuanaco is the Sun Gate. 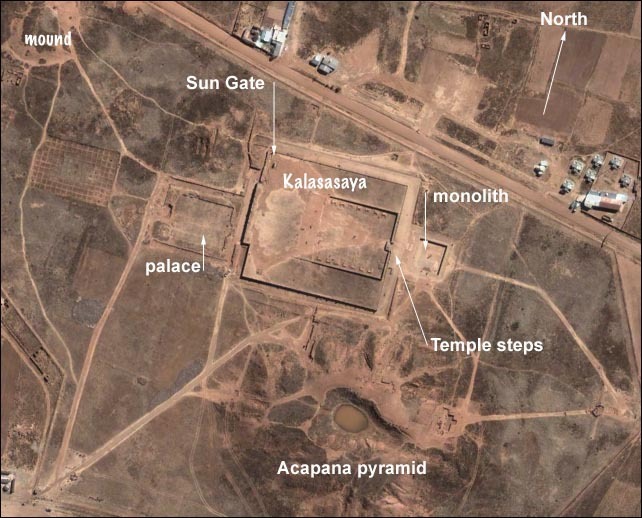 This structure has been described as a "calendar" almost as long as the monolithic gateway has been known to exist; thus the Sun Gate has also been called 'the Calendar Gate'. This calendar sculpture, though it undoubtedly depicts a "solar year," cannot however be made to fit into the solar year as we divide it at present. The calendar has only 290 days, divided into 12 "twelfths" of 24 days each, plus 2 intercalary days added to make the cycle complete. Some researchers have attempted to explain this as being a ritualistic calendar while others have claimed that, 14,000 years ago, the length of a year was somehow different from today. Still others believe that it may represent a year on some another planet. Extraterrestrial connections were first suggested by Eric von Danken and have been perpetuated by discoveries of the apparent advanced knowledge that Tiahuanacan engineers seemed to possess -- thousands of years ahead of other cultures. Analysis of this culture has shown that ancient Tiahuanacan scientists knew that the earth was a globe which rotated on its axis and they calculated exactly the times of eclipses -- even those not visible at Tiahuanaco but visible in the opposite hemisphere. Scientists have also ascertained that the Tiahuanacans divided the circle mathematically into 264 degrees (rather than 360 as was initiated by the Babylonians); they determined the correct ratio of pi (22/7), and they could calculate squares (and hence, square roots). [Left:] Entrance to the temple, showing the characteristic stone construction of the site. It was common for many huge, flat faced stones to be used to construct walls. Some of the stones show evidence of tooling that simply could not have been done with any known ancient technology. [Center] Carved stone block at Puma Punku. This precision-made 6 mm wide groove contains equidistant, drilled holes. It seems impossible that these highly precision cuts were made with use of stone or soft copper tools. The purpose of these alterations is not known, but it has been suggested that gold or bronze plates might have been affixed to the walls. Others suggest the giant stone blocks were locked together with metal. [Right:] Large idols were carved from single massive stones and appear to have been polished and finished by unknown methods. The modular technique allows the blocks to be mass produced on site and assembled in a variety of configurations. This technique appears at Tiahuanaco fully developed with no prior evidence of experimentation. Where did the engineers of this era get their ideas or experience? Why is this the only example of modular construction in the ancient world? These are but some of the many questions remaining to be answered at this remarkable site. [Right:] Stones were often secured to adjoining stones with metal "staples." Matching grooves were carved in the top of the stones as they lay side by side. Then, molten metal was poured and allowed to harden, securing the two stones together. This technique was also utilized in Egypt and in Southeast Asia. The fact that the culture of Tiahuanaco appeared fully developed in this high altitude, arid and inhospitable land is a real puzzle. Almost immediately they seem to have used advanced building techniques like modular construction. Huge blocks were carved from single stones and designed to fit together on the site with exact precision and artistic style. These techniques were only developed by modern builders in the last century. The massive blocks are extremely stable, resisting both time and earthquakes. But how were they made, transported and positioned, apparently by hand? Tiahuanaco is located on the Southern shore of Lake Titicaca. Puma Punku [Above], Southwest of the temple structure, truly staggers the imagination. 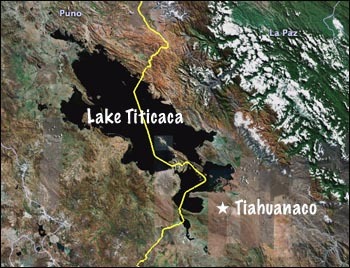 In the past, the lake was much higher and its shores lapped Tiahuanaco. 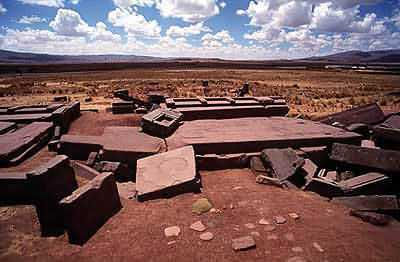 Near the site, at a site called Puma Punku, there is a massive, four-part, now collapsed building. One of the construction blocks from the pier was fashioned from a stone block that weighs an estimated 440 tons (equal to nearly 200 full-size cars). Several other blocks are between 100 and 150 tons. 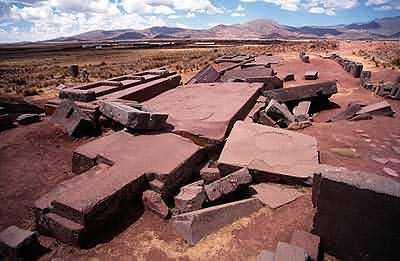 The quarry for these giant blocks was on the western shore of Titicaca, some ten miles away. There is no known technology in all the ancient world that could have transported stones of such massive weight and size. The Andean people of 500 AD, with their simple reed boats, could certainly not have moved them. Even today, with all the modern advances in engineering and mathematics, we could not fashion such a structure. How many people lived there? The region was believed to have been populated by about 100,000 people at its peak. This estimate is based on the amount of pottery and other artifacts that remain and the total land area (more than 400 acres). Because this large population would require a significant food source, many scientists doubted that this was possible, especially at 13,000 feet. Thin air drops the ambient temperature to below freezing at night causing a frost that kills most plants. Recently, however, an aerial survey of the site revealed the solution. 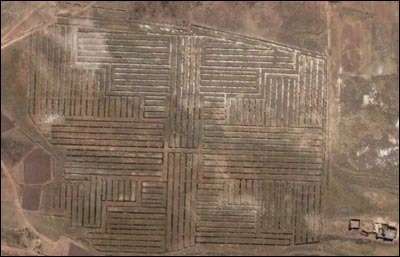 Multiple grid and maze like structures throughout Tiahuanaco, visible only because of the discoloration of the underlying soil, were discovered to be an ancient network of gardens and canals, capable of growing potatoes and other crops. The plan was ingenious. Canals were placed in grids that surrounded the narrow gardens. The depth of these canals was kept to from 24 to 30 inches so that the strong daytime sunlight could easily warm the water. In the evening, when the frigid air caused frost, the canals vented their stored heat in the form of a fog. This kept the temperature around the plants elevated above freezing and also helped irrigate them. It is interesting to note that the canals were constructed in a well planned and artistic pattern. This further indicated the intellect and aesthetic appreciation of this culture. How old is this site? The age of Tiahuanaco is difficult to assess and very controversial. Polish-born Bolivian archaeologist Arturo Posnansky has concluded that the Tiahuanaco culture began in the region at about 1600 B.C. and flourished until at least 1200 A.D. His disciple, Professor Hans Schindler-Bellamy, believed Tiahuanaco to have reached back 12,000 years before the present era, although a more conservative Peruvian archaeologist. More recently, other archaeologists have pushed back the date to an amazing 14,000 years ago. 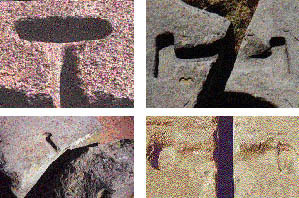 The controversy arises because most of the datable artifacts are from the more recent past, while the stone megaliths and other structures do not lend themselves to dating techniques like Carbon 14. Many stone pieces have been uncovered from more than six feet of earth. The mountain ranges which surround the area are not high enough to permit sufficient runoff of water or wind erosion to have covered the ruins to such a depth. This suggests a very old date as the accumulation of sediment is slow in this arid land. There is also evidence that architectural structures exist at the bottom of Lake Titicaca, suggesting that the civilization existed before the lake was formed. Many scientists believe that the lake formed during some great flood and find similar legends around the world of a flood dating back thousands of years. The local legend contains reference to this flood in their creation myth. The religion of Tiahuanaco centered around the cult of a sky and thunder god Viracocha. The deity was generally depicted as having staves in both of his hands and an aureole around his head. 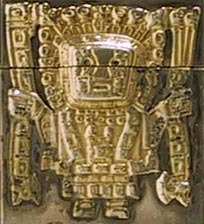 The aureole suggests the qualities of a sun god, represented on the bas-relief in the upper part of the famous Sun Gate in Tiahuanaco. According to legend, the world was created by Viracocha near Lake Titicaca. After the great deluge or the receding of chaotic floodwaters Viracocha descended to earth and created plants, animals and men to the empty land; he built the city of Tiahuanaco and appointed 4 world rulers of whom Manco Capak became the superior of the Ursa Major world, i.e. the north horizon (Busto II 1981: 7). The lake appears to lack a source, such as a river or stream, and there is proof that it is slowly evaporating and its shoreline receding with the passage of time. To date, there has been no satisfactory explanation of how the lake was formed in the first place. This is just one of many mysteries of the region and ranks Tiahuanaco as one of the top ten mysterious places on Earth. Cool. I wish I knew more about the Indians who lived there. What do they think of the so-called alien connection? Wonderful article. The suggestion of “Extraterrestrial connections” although entertaining, is distracting and ridiculous. If we stay on course and work with how did “we” do these things back then… and focus on what was the world like 14,000 years ago… I think we will arrive to some potential solutions. We may end up looking at the world differently. Now better equipped with the acknowledgement of Global Warming as a process soon to end life as we know it… knowing our history may help us acknowledge just how fragile we are, and volatile our planet really is. Let us focus on what we really need to do to survive? Alien beings didn’t propel themselves through space in carved stone space ships. Come on people. The fact that these early Peruvians understood the earth as a planet as early as what… 1200 AD… is not short of amazing. Just because we lack the imagination to presently come up with potential solutions, what… we jump to outrageous conclusions that alien creatures joined humans’ quest. This is iconoclastic. We know the city exists and humans built it. Now how did we do it… and more importantly why? Was some form of slavery involved? Etc. We don’t want to go down the road of wondering what color the aliens were. Do we? I think it is incredibly sad that we still cannot overcome our superiority complex as a society and continue to attempt to try and demean the work of past communities by attempting to attribute such work to some sort of outside influence. Is it so hard to swallow that perhaps the people that came before us had techniques and knowledge that perhaps surpasses our own? Or are we just so conceited that we still cannot accept anyone who came before us could possibly have a greater understanding of the world and could be able to create structures and monuments even today we marvel at. However hard we try to paint it, we are not the pinnacle of human existence, humanity and evolution is not on a teleological scale and to attempt to label these societies as having 'simple' technology and 'unable' to create these fantastic pieces of archeology when they clearly have more substantial evidence for their creation than aliens cracking whips is just close minded, arrogant and insulting to the people who built Tiahuanaco.